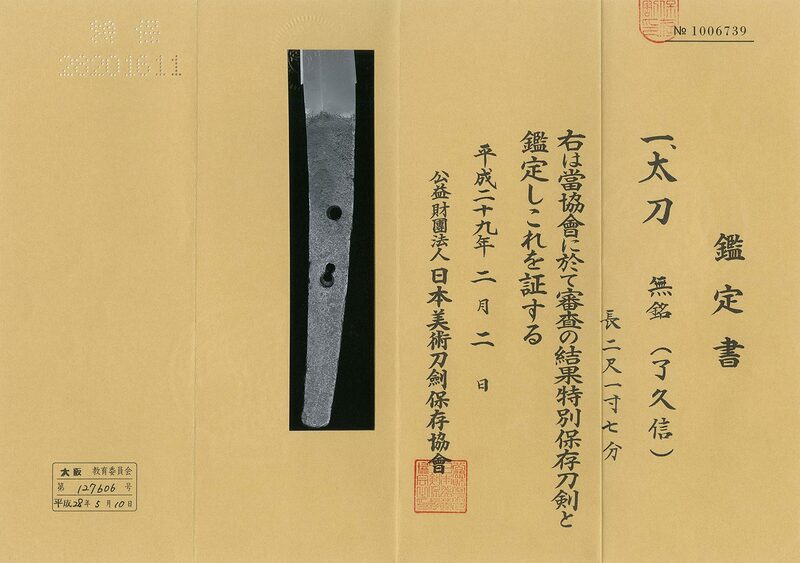 Katana: Mumei attributed as Ryo Hisanobu. Signature : Mumei attributed as Ryo Hisanobu. This sword belongs to yo Jyo saki ranking. Habaki :Gold wrapped double habaki. Blade length :　65.7　cm or 25.86 inches. Sori :1.9cm or 0.74 inches. Width at the hamachi : 2.5 cm or 0.98 inches. Width at the Kissaki : 1.5cm or 0.59 inches. Kasane : 0.5 cm or 0.19 inches. Era : Kamakura period Enkei era. 1308.
slender Deeo sori beautiful shape. Hamon :Suguha hamon nioideki bright and clear. Boshi: is round midarekomi hamon. Rai school or his father’s nobukuni style. He sometimes made his father’s sword as Daisaku. Koshirae : Tachi Kosirae all matching Koshirae. Saya :on the black brown color saya, some designe are engraving. Tsuba :Kiku flower design is engraved by copper plate. Menuki : a dragon is engraved by solid gold ? Fuchikashira and other fittinggs are all matching shibuichi palte. and has kept so long period(710 years) and also with nice Koshirae. The sword is keeping good condition and nice elegant shape. Koshirae is not ornate koshirae but well harmony with this sword. Aoi Art estimation paper : NBTHK Tokubetsu hozon paper.